Y’all know I love pasta, + I especially love a pasta dish that’s as quick + easy to make as it is delicious. I’d been seeing a One-Pot Tomato Basil Pasta coming across pinterest + facebook a lot recently, + I decided to give it a try with a few changes of my own. 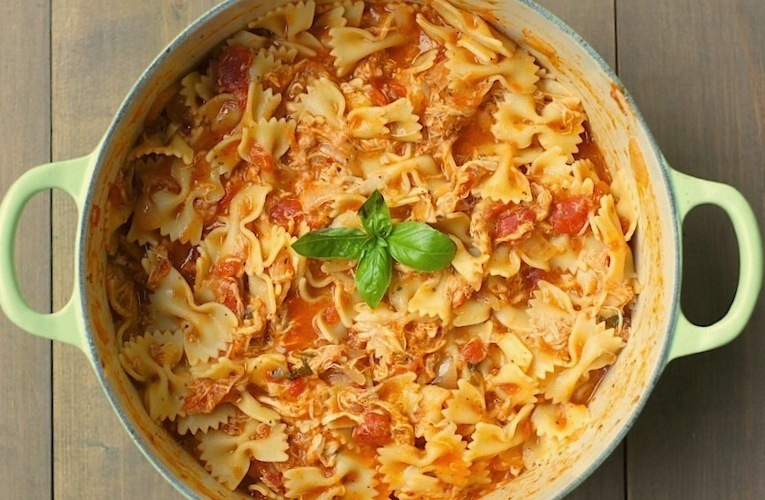 In this recipe, rather than boil the pasta separately like you do with most pasta dishes, you cook it in the pot with the broth, tomatoes, + herbs. The benefit of cooking it this way is two-fold. First, it imparts a ton of flavor into the pasta, as it gets to absorb all sorts of awesomeness. And second, it saves time, as you only have one pot to clean up at the end! So, how was it? Really flippin’ delicious! Between the seasoned diced tomatoes, the italian seasoning, + the fresh basil, it has a bright, delicious herb flavor. As the pasta cooks in the broth, the starch releases out, creating a creamy, rich tomato sauce. While the original recipe is vegetarian, I added chicken to mine, + am so glad I did. The chicken adds a whole ‘nother level of flavor, plus packs an awesome protein punch. The end result is a super simple, yet truly scrumptious pasta dish. And since it’s all cooked in one pot (and takes less than 20 minutes total), it’s perfect for a quick, easy-to-clean-up weeknight meal. 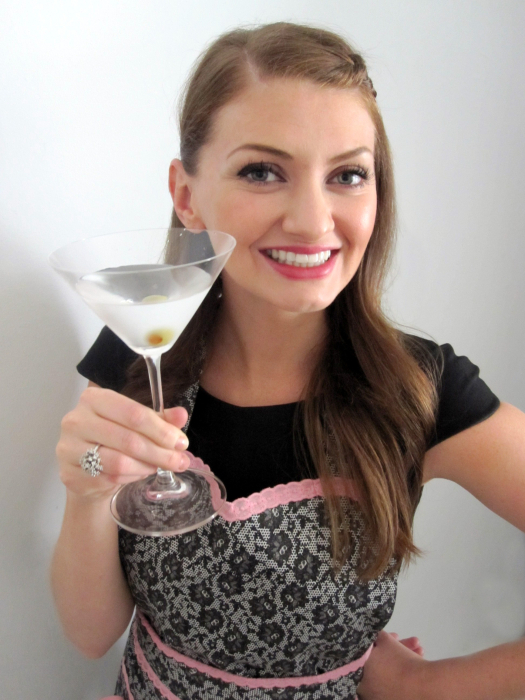 Give this one a try, friends – I think you’ll love it! Heat 1 tablespoon olive oil in a large stock pot over medium heat. Once hot, add the chopped onions + cook until onions are translucent + softened, about 7 minutes. Add the garlic + cook for 1 minute more, until fragrant. 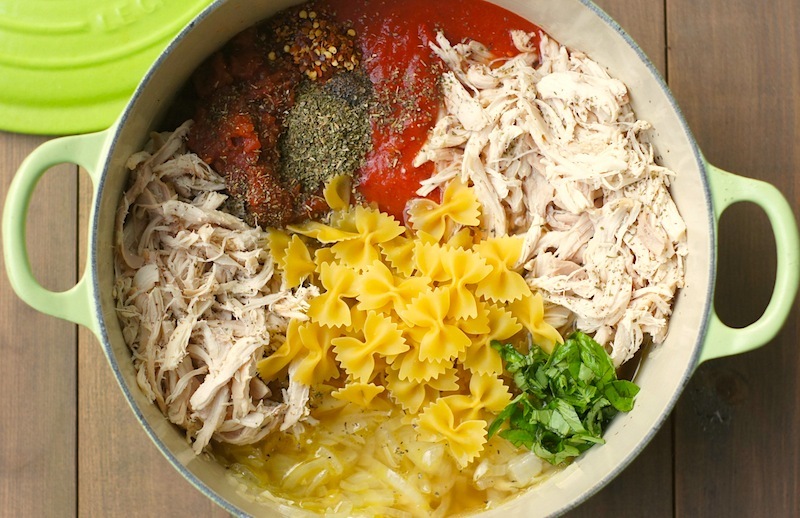 Add the remaining ingredients to the stock pot – the pasta, diced tomatoes with their liquid, crushed tomatoes, shredded chicken, red pepper flakes, italian seasoning, fresh basil, chicken broth, remaining 1 tablespoon olive oil, salt + pepper. Stir everything together until well combined. Bring to a boil. Cover, reduce to a simmer + cook for 10-15 minutes (depending on the type of pasta you choose), stirring frequently. Cook until almost all the liquid has evaporated + pasta has reached an al dente consistency. Add more salt + pepper if needed + stir well. 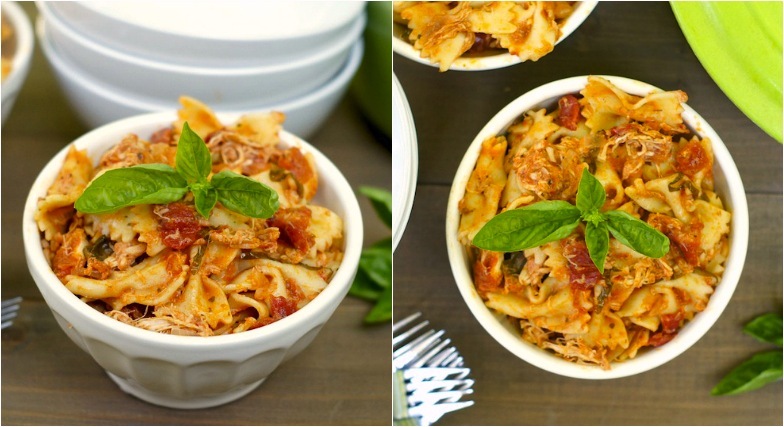 Serve with a generous topping of freshly grated Parmesan cheese + enjoy! This is on the menu for tonight, can’t wait to try! I am also going to prep an extra batch as a freezer meal to throw in the pot on a busy night. Awesome, Jill! Do report back how it is – I hope you love it! The pasta gets added raw and gets cooked during the process, right? I’m sorry this is not (and will never be) the way we cook pasta in italy! Nor did I say it was, adaROMA. Thanks for visiting, though! One pot meals, for the win! This looks AMAZING! whats good!, I do believe this is an excellent website. I have yet to try this but it is on my to-do list! It looks yummy and how can you beat a one pot meal when you are too tired to think! Your photography is awesome!! One pot! Oh yeah, that fits my comfort zone. The only way this could get better would be to put it in a crock pot. I’ve never tried these types of pasta noodles in a crock pot before. Do you think this would work? Thanks for the share, trying this tonight. Hi Nick! I rarely do anything pasta-related in the crock-pot, because it’s easy for the noodles to get overcooked/soggy. I love crock-pot cooking, too, so I might have to try to adapt this to make a crock-pot version. My first thought would be to combine all ingredients in your crock-pot (the onions and garlic will be uncooked in this case, unless you saute them on the stovetop first), cover, and cook on HIGH for probably 30-1 hour minutes, then continue on HIGH uncovered for maybe 15 minutes (to thicken up the sauce)? I’ll have to test it out to see how long it takes, but that’s my first guess! I am a long proponent of one pot dishes. Awesome suggestion, GT – I will definitely be trying that! Wow! It looks very yummy! Feel starve right away! Looks delicious,can’t wait to try! Hope you love it when you try it, Sharon! This looks delicious! Cant wait to try it. yay for finding unconventional ways of cooking traditioonal meals! I’ve made this about four times now, and every time it ends up a bit mooshy because I have to cook it way longer to get the liquid out. Don’t get me wrong, it’s still delicious as a mushy stew, but nothing pretty and presentable I’d make for company… any advice? Hi Lyndsey, It sounds like your pasta type/brand doesn’t need as much liquid/time to reach the al dente stage, so you’re winding up with too much liquid AND too much cooking time. Next time you make it, try reducing the liquid — let’s say, to 1.5 or 1.75 cups of broth instead of the 2.5. And then check it after 10 minutes of covered simmering, and see if it’s ready, or if it needs more time. I bet that will do the trick! If, it looks like it needs a bit more liquid, add in 1/4 cup more broth at a time. It’s all about finding the right balance of pasta to liquid to cooking time. Let me know if that helps! I love this recipe. I made it the other night. It was the easiest recipe i’ve made in a very long time and it turned out amazing. I even brought some in to share and everyone wants the recipe. Thank YOU !! Thank you so much for sharing, Jaysen! I’m thrilled it was such a success, and I so appreciate you popping in to tell me. Cheers! Totally worked with less broth! Thanks! Yay, I’m thrilled to hear it, Lyndsey! You awake my appetite 😀 very interesting post.Thanks for this sharing post. By just looking at the photos above, I’m sure that it taste great. I love chicken and i’m surely gonna try this one. Thanks for sharing your tomato basil chicken pasta. I Actually a traveler that ALWAYS attracted in food.. LMAO anyway You got my attention. seriously its look delicious I love it , and i also a food explorer. that’s why another reason why i go travel .and i taught i will never know this recipe i will tell it to my wife that she will cook pot tomato basila chicken pasta. I hope more Food post on this blog 😉 just kidding i’ll keep in touch just keep it great.. Very tasty! I think next time I will add more chicken though. Did not enjoy this sorry. The pasta had such a wrong texture to it. Served it al-dente and it quickly turned to starchy mush. I couldn’t even eat the leftovers. Sorry to hear it, Steph. Hopefully you find another recipe on here that you like better! This looks so good and your pictures are stunning.. Thanks for sharing!! Hello, what an informative and comprehensive article. Helped me very much with my issue. Appreciate the facts you have pointed out. Totally true! Nice recipe!! It looks yummy! Do you use ceramic cookware sets or traditional cookware ? I love chicken pasta. I can literally eat it every night. I usually change up the marinara sauce every night. Be always fresh tomatoes and all natural stuff. That looks really delicious !